Valve have created themselves an interesting situation. Presenting themselves as bastions of consumers, remarkably accessible to gamers, regularly inviting in groups of modders – often to give them jobs – and always being present to offer a quote on how customers deserve to be treated with more dignity, they establish themselves as being our friend. And then from that position, they sure do like to muck about. And as Eurogamer's Tom "Tom Bramwell" Bramwell mentioned on Twitter this morning, it's hard not to sympathise with a growing body of Valve's customers who are asking for better communication. If Episode 3 went horribly wrong, it would be fascinating to know. No one has a clue what they're up to. Games are sometimes announced moments before release, or years in advance and then nothing but silence. Sometimes when they tease it's obscure, frustrating ARGs that eventually end in a new pretend hat. Other times it's a complete open door and everything revealed. They hide clues in so many places that people end up scouring everything they do for a hint, a glimpse, of something that might suggest they'll eventually return to the Half-Life universe proper. They've turned gamers into pseudo-schizophrenics, people frantically trying to find patterns in the random, believing there are hidden messages within their communications. But does anyone have a "right" to know what's going on with the Half-Life series. Clearly not. It's absolutely Valve's prerogative if they want to never make another Half-Life game again, and concentrate only on adding new hats to TF2. And should they tell us they're doing that? No – why should they? They are a privately owned company, without shareholders to answer to, not required to reveal their plans to anyone. Should they tell anyone what they're up to? I think it's probably about time they did. For many years Valve have ridden a wave of remarkably good grace. Developing and releasing extraordinarily good games gets you a long way, and Valve have consistently proven themselves to be the best in the world at what they do. From the astonishing shake up of gaming that Half-Life caused, to the zenith of the FPS, still unbeaten seven years later, Half-Life 2, and then the excellent Episodes, both Left 4 Deads, the Portal games, and TF2… there is no other record like it in gaming. There's a reason Valve has the reputation it has. But their peculiar secrecy doesn't seem to do them any obvious favours. When they revealed the existence of DOTA 2 or Counter-Strike: Global Offensive, the gaming press was obviously extremely eager to give this as much coverage as possible. They're Valve games, so there's an extremely good chance they'll be very good. (Not guaranteed of course. There's always Ricochet, conspicuously absent from their Games page.) Readers want to know about them, sites want details about them, and Valve wants the coverage. It all works. So when they go quiet, after two episodes of a promised a three part episodic series of Half-Life games, it's understandable that people get annoyed. No, no one has the right to know – it's absolutely their private business, and they may keep it as underwraps as they wish. But I'd suggest at this point, this many years into what is now appearing quite a farce, it's doing damage to their reputation. • Interview: BioWare's James Ohlen On SWTOR " I think it's because story is timeless – people love to live through story." • Killer Instinct: A Hitman Absolution Preview "Oh, we are skeptical souls at RPS. Though we loved Hitman: Blood Money, we have been somewhat wary of Hitman: Absolution." • Delicately Debating Darkness II's Demo "Immediate thought: it's so noisy! It's so sweary! It's so violent! Does old man Doom know that his kids have turned out like this?" Clearly the actions of Axel "Ago" Gembe were absolutely unjustifiable, and the leaking of Half-Life 2 scarred Valve very badly. Gembe's given motivation was his frustration about the lack of information being released about the game, and his eventual discovery that Valve weren't revealing quite how far from finished the game was. Leaking the code was a stupid and cruel act, and Simon Parkin's wonderful article about his attempts to broker peace between the two many years on shows that Valve are still hugely angry and upset about it. None of it should ever have happened, but what I find peculiar is that Valve apparently learned no lessons about the frustration they generate in their most dedicated fans. The silence over Episode 3, or what for seemingly no reason most now think will be Half-Life 3, is infuriating. And not because we deserve to know about it, nor because Valve have any obligation to say. But unfortunately, Valve have confused us. They act in an extraordinarily open way in so many cases, with remarkable access via email, and an engagement with the community that's the envy of the gaming world. While they of course receive backlashes, and there is a contingent of Angries who will always hate them, the goodwill they receive is enormous. This, combined with their more recent engagement with complex ARGs and hiding clues everywhere, has given the impression that they want to share what's going on with us. And that confuses us. If Episode 3 went horribly wrong, it would be fascinating to know. If they developed the game and it was complete arse, it wouldn't damage Valve's reputation for saying so. 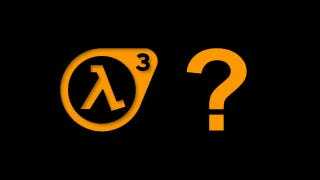 If it's been in ongoing development, constantly iterated and improved upon, perhaps even morphing into Half-Life 3, everyone would be so excited to hear. If they just ran out of ideas, or got bored of Freeman, we'd love to know why. So no, of course Valve has no obligation, and we have no right, to know what's happening. But I'm struggling to think of a reason why it would harm them to keep us up to date. Were they a completely secretive organisation, unreachable, who only announce a new game the day it comes out, then our expectations would be somewhere else. But it is the confusion of the contradiction of Valve's surprising openness and closed secrecy that leads to the bewildered frustration of their audience.